All the very best to those of my friends who are celebrating Canada Day! 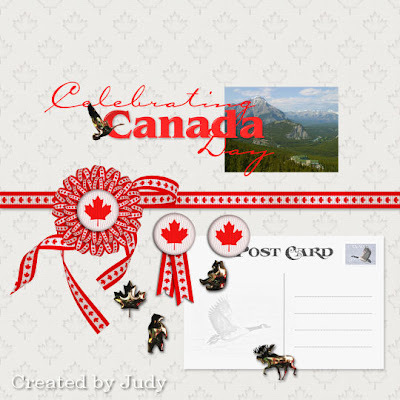 A few bits and pieces for your Canada Day album page, all created at 300 dpi. I've included the text, ribbons, ornaments and a blank postcard. Super new kit . Thankyou Judy ! Thank you from the bottom of my Canadian heart! Thanks so much. I often feel like Canada is my second home so I especially enjoy the Canadian themed work you have done. Your Canadian creations are excellent. Thank you!